Reader Contribution Du Jour: Edie’s Big Adventure! I’m a photographer for the DA’s office and there is a women there who makes these models (trains, apts, buildings, etc) for court cases, as a visual aid for the jury. 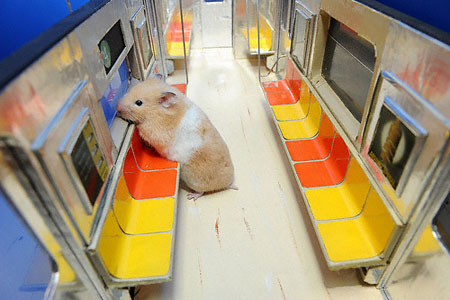 The train is perfectly hamster sized so I brought my super tame hamster into work yesterday for a little photo shoot. They came out better than expected. I’m really excited about them. Well done, Victoria! I can only hope Edie will go on more adventures in the near future. 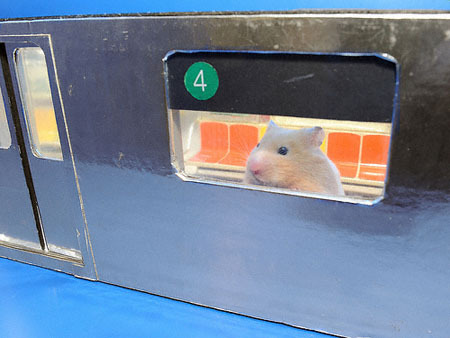 Perhaps next time she can ride the G train or drive one of those new buses with fellow rodentia in tow? * In any case, you can see more of Edie and her introduction to the joy that is mass transit by clicking here. WARNING: by clicking the aforementioned you will view images that are mind-blowingly adorable! *Replete passengers sporting earbuds, i-Pods, and and i-Phones. 9 Comments on Reader Contribution Du Jour: Edie’s Big Adventure! nice! thanks for posting these. i am particularly fond of the staring out the window shot. Thank Victoria. She was the one who took ’em and consented to me posting them! I think Edie’s next photo shoot should be Edie the bus driver. I envision her manning the wheel of one of those brand new B61 buses teeming with furry commuters! Many props! Sweetest, happiest stuff I’ve seen in a long time! Thank you! P.S.–I’m assuming that Edie is a Yankees fan, as we’re riding the 4. Don Zimmer, longtime Yankees coach, was known as “The Gerbil” during his tenure with the Red Sox in the late 70s. 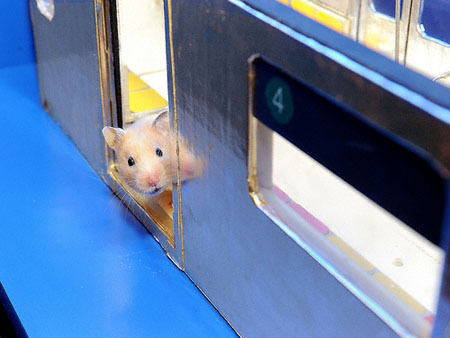 How do you tell a hamster to quit holding the doors? AAAAAAHHHHHHH! I’m in LOVE with this!!!!! I’m off to view that link!